Just when you thought it was strange for your mom to have Facebook; Imagine getting a friend request from Iran’s highest hard-line clerical leader. Khamenei started the page Dec. 13, which has photographs of the 73-year-old mullah and links to YouTube videos and Instagram pictures. The page currently has more than 12,000 likes — fueled in part by an announcement on the clerical leader’s official Twitter account . The plans may have backfired, however: Based on some of the heavily negative comments already written on the page, it appears some “liked” the page in hopes of directly getting their messages to Khamenei. 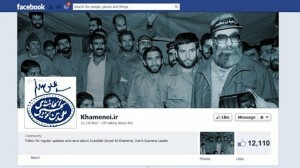 Their messages are being countered by his supporters on the page, however, and not by Khamenei himself. “If this page was meant for communication, then why are some of the comments being erased?” wrote one Iranian. Another wrote, “I hope one of your loved ones is killed at the hands of this brutal regime. Then you will be with us, cursing the regime,” in response to previous comments praising the regime. Others warn that the Facebook page will serve as a government sieve, giving the regime a new roster of cyberenemies to target. “If the cyberpolice in Iran see a girl, for example, without a headscarf [in her profile picture] or read an anti-government message on this page, they can use this to come after these individuals,” said Roozbeh Farahanipour, a former student activist and founder of Iranians for a Secular Iran. “We are fighting with words, but they are fighting us with bullets and guillotines,” she told FoxNews.com. Less than two months ago, the regime allegedly tortured to death 35-year-old blogger Sattar Beheshti, who was targeted for continually publicizing social and political issues that were considered unflattering to the regime on his personal blog and on Facebook. 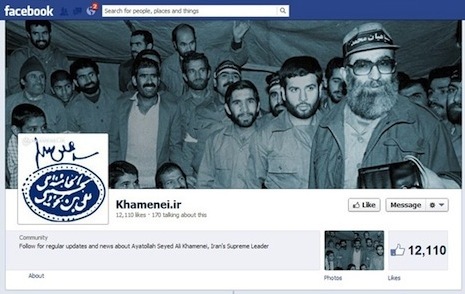 Farahanipour has started an online campaign to get Facebook to remove Khamenei’s page. He has circulated a diagram including step-by-step directions in English and Persian on how to report the page to Facebook. “Khamenei should not be allowed in the same space that he forbids Iranians from entering,” Farahanipour said. While Beheshti was a small threat to the regime, his torture and subsequent death may likely have been a pre-emptive warning to the millions of young Iranians who have taken their anti-government disenchantments to the blogosphere. Since the anti-regime protests of 2009, dubbed the ‘Twitter Revolution,’ the Iranian people have had an overwhelming presence on social media sites and blogs. The regime often cuts Internet service or blocks access to popular sites such as Facebook, Google and YouTube. Iranians have learned to bypass the censorship through proxy sites and software. Since the 2009 uprisings, roughly $76 million of the total $11.5 billion allocated to the Islamic Revolution Guard Corps has been spent on cyberwarfare. Iran’s cyberpolice monitor the Internet, various websites, blogs and individuals suspected of using circumvention tools designed to evade the censors. In early 2011, Iran unveiled plans for a “halal network,” or an “Islamically permissible” intranet that would disconnect the nation from the rest of the world. Such a service would automatically block popular global sites and search engines like Google, Facebook and Wikipedia.